as some of you may know I used to dye my hair black. I stopped a year ago & ever since I'm trying to get back to my natural colour. But my love for dying my hair isn't yet over, so I sometimes decided to dye the end since they still got dye on it from years ago. 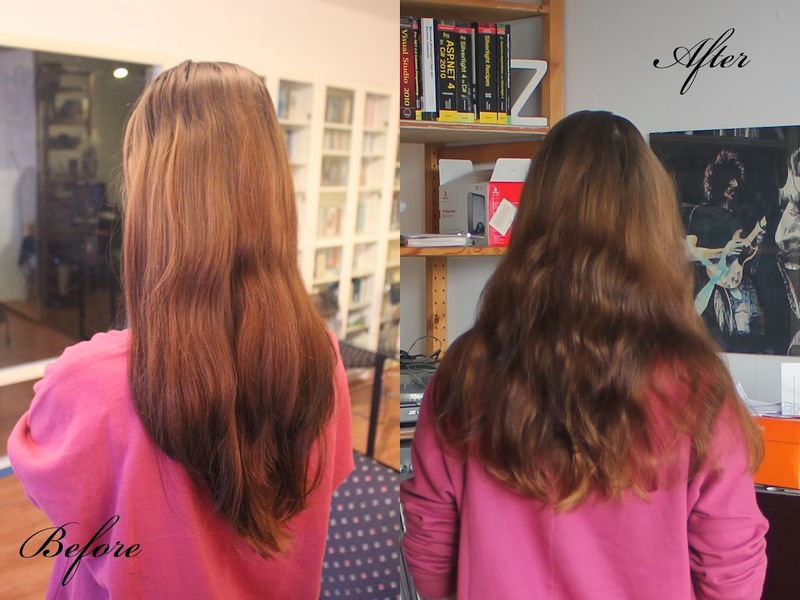 && that's how I came with the idea to try out the L'Oréal Ombre hair colour Préférence Wild Ombrés. At the local drugs store was a sale, two for the price of one. So I also decided to take the copper coloured hair dye with it, for if I loved it. I got the wild ombré in the colour shade 1, dark to medium brown hair. Each pack comes with 1 tube of lightening crème, one applicator bottle of developer crème, one sachet of lightening powder, one nutri-ceramide conditioning shampoo, one easy to use brush, a guide & one pair of gloves. I found some handy videos on youtube with how to apply the ombré dye. It was really useful to watches a couple of those videos, they explain very clear how to use it and how it should turn out. My honest opinion; I have never used a hair dye that was this expensive (besides from when the hair dresser did it) so I had a lot of high hopes. The first surprise was the chemical smell, it was horrible and everywhere. I have never ever used a hair dye that smelled this bad. I was kind of relieved when I could wash it out of my hair. The easy to use applicator brush wasn't easy to use either. It waists a lot of product because not everything ends up in your hair, most of it just sits on the brush. It literally doesn't want to stick to your hair. After a while I got the hang of it and it turned out as in the videos. After 30 minutes of letting it sit in my hair it was time to check it. I actually skipped the whole checking my hair part because of the smell. I just washed it out. The shampoo what came with this dye was actually really nice. After washing my hair out I decided to apply some olive oil && let it sit for half a hour. I than washed my whole hair. It doesn't feel damaged which is a big relieve. It doesn't looks horrible or ruined, I kind of was afraid it would fail and turn yellow or green. I actually took some before and after pictures and just take a look for yourself and tell me what you think. Because honestly I can't really tell the differences. Left is a picture of my hair before I dyed it and right is the picture after using the dye. I'm not really convinced or impressed with this expensive hair dye. I mean for €16.95 I expected a bit more. I'm going to try the copper coloured ombre dye another time, I may write a review. If I don't it's not I probably got the same result as with this dye, none. What are your experiences with the hair dye by L'oréal?